I might be biased since I’ve been eating tofu most of my life, but I like the stuff! It is versatile and soaks up any flavor you put on it, fairly inexpensive, and just full of protein. I usually buy extra firm water-packed tofu from the refrigerator section of just about any grocery store. The different firmness levels are good for different recipes, but for the most part the extra firm works for my daily purpose. This basic tofu recipe is how I make my tofu before adding it to my Thai Curry, Pot Pie, and Veggies and Peanut Sauce. I use a similar procedure for my Breakfast Sandwich, and pretty much any time I make tofu. Tips, tricks, and variations below the recipe. Add oil and swirl to coat the bottom. Add tofu and cook on one side until brown, about 2-3 minutes. 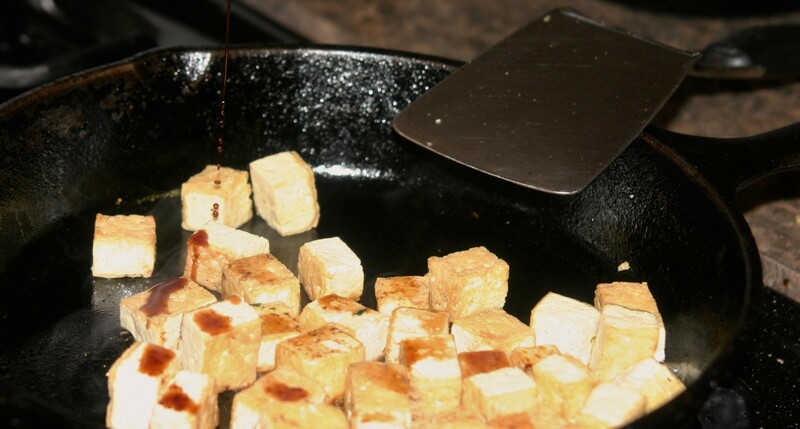 Flip tofu and continue cooking and turning until brown on all sides. Let the pan cool for 1 minutes (optional step). Drizzle the tamari over the tofu, and stir briefly to coat all pieces. What is important for successful tofu? Because of the way I cook it I find bringing flavor in some type of liquid so the tofu soaks it up. I also always use some time of salt because tofu is rather bland. One of my favorite combinations is Tamari, Worcestershire, brown sugar, and a little water. I use this as a sauce for a stir fry with eggplant, tofu and broccoli. Super yummy!